PRAGUE -- Since China’s annexation of the short-lived Uyghur state of East Turkestan in 1950, Beijing has pursued a development policy that has put considerable pressure on the local environment. This northwestern region, which borders Central Asia, is home to China’s main nuclear testing site, a blight with which some Central Asians are all too familiar. But the most immediate regional concern is water. China’s "Go West" policy, which Beijing says is aimed at further developing poorer hinterland, requires ever-growing amounts of water, and will have long-term implications for Kazakhstan which shares a number of trans-boundary rivers with China. "For Kazakhstan the most alarm concerns two rivers: the Ili and Irtysh," Mels Eleusizov, head of the Kazakh nongovernmental organization Tabigat, or Nature, told Radio Free Europe/Radio Liberty. "The new infrastructure and plants in Xinjiang consume a lot of water. The drinking water needs are increasing too." "If China continues to increase water consumption in the area, it will certainly affect the water resources on our side." Eleusizov said. In about 50 years the situation might be even worse than in the Aral Sea. The Ili river flows through Xinjiang into southeastern Kazakhstan and terminates in Lake Balkhash. The Irtysh rises in China's Altai Mountains and also crosses into northeastern Kazakhstan, before flowing through Lake Zaysan to the Russian city of Omsk and then into the Ob River. The increasing usage of river waters in Xinjiang, which has relatively few water resources and little farming land, is a crucial side-effect of Beijing’s policy of attracting ethnic Han Chinese settlers to the region in the name of stability and economic development. "There's actually a lot of concern coming out in China in the government [media]," Ann McMillan, who researches the region at Griffith University in Queensland, Australia, said. "There've been reports about the water table dropping, especially around Urumqi, the capital of Xinjiang." "So they are aware that they've got major problems. And they’ve even started charging for water in some places. But for their development to go ahead they need water. So you’ve got a ‘Catch 22’ situation," McMillan said. The Irtysh and Ili are crucial sources of fresh water for the Kazakh populations. Both also play a vital role in the economy, providing water for the industrial, agricultural and fishing sectors. "If the level of the river decreases, the environment along the banks will be affected drastically. Local citizens will suffer a lot," Kazakh MP Myrzageldy Kemel told RFE/RL. "Now nobody is paying attention to this, although in about 50 years [the situation] might be even worse than in the Aral Sea," said Kemel, who serves on a parliamentary committee for the environment. The Aral Sea, which has lost three-quarters of its volume since 1960, when Soviet-era planners began diverting its feeder rivers to irrigate cotton fields, is to be one of the world’s worst man-made environmental disasters. The completion of the canal will affect us drastically. The United Nations Development Program (UNDP) has warned that Kazakhstan’s current largest lake, Lake Balkhash, is in danger of drying out if the government fails to adopt better water management practices and win Chinese cooperation over the Ili, the lake’s main tributary. The current construction by the Chinese of a 300-kilometer long and 22-meter wide canal to reroute water from the Irtysh is also of great concern, according to Abai Tursunov, a professor at the Kazakh Institute of Geology and Geography in Almaty. 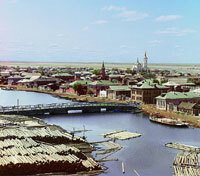 "The completion of the canal will affect us drastically," Tursunov said. "Power stations will be very much affected. Nobody is raising the issue but gradually all this can lead to major environment problems." Hydropower stations and factories are located along the Irtysh, while the Irtysh-Karaganda canal makes agriculture possible in central Kazakhstan. The river also provides drinking water to the capital Astana as well as to thee other major cities: Karaganda, Semipalatinsk and Pavlodar. We are going to use no more than 40 percent of the waters. "We currently use 10-20 percent of the Irtysh's waters," Zhou said. "We are building new infrastructure. But we are going to use no more than 40 percent of the waters." In 2001, Kazakhstan and China signed an agreement aimed at facilitating cooperation on trans-boundary water management. Through consultations the two states agreed to share information concerning the Irtysh, with the Ili being agreed upon afterwards. But Zhakybay Dostay, also of the Kazakh Institute of Geology and Geography in Almaty, said the talks have led nowhere so far. "The joint Kazakh-Chinese inter-government commission meets every year without results. They just give figures, make statements, and sign documents. The problems remain." Kazakh President Nursultan Nazarbayev visited Xinjiang in September. But there is no indication that he raised the issue of trans-boundary rivers with Chinese officials.